On Wednesday April 18th, Radio 2 Limburg went on air, in the air. Quite literally, Radio 2’s main idea was to produce a two-hour live radio and multicam web-video show in a hot-air balloon’s basket. In a conventional world they would've needed three flight cases and a big desk, for the radio part alone. For the video part a flight-kit or a small OB would've been used. Obviously both do not fit in a hot air balloon's basket, so we needed to come up with a more compact solution. This successful endeavour was led by VRT Sandbox as a part of our mission to boost media innovation. “We came up with this crazy project to produce a full radio show from a hot-air balloon, a first in Belgium! The idea was very exciting but also full of challenges. Our colleagues from VRT Sandbox and VRT’s innovative department introduced us to a solution provided by On-Hertz. It allowed us to make a fantastic broadcast from a unique and not so obvious location. On-Hertz did the job perfectly”, said Daan Masset, Radio 2 presenter. Schoonbroodt’s start-up company, On-Hertz, provided an embryonic version of the LUMO virtual radio software containing a mixing console, microphone EQs and dynamics, jingle and playlist players and a telephone hybrid system. The software also included an audio matrix for different output mixes. The presenter used a Sennheiser HMD 27 headset. This provided hands-free operation for the DJ, as well as coping with the noise from the balloon burner. For the live multicam video, the balloon studio was equipped with four Logitech Brio 4K HD webcams, controlled by a laptop running the vMix live streaming software. 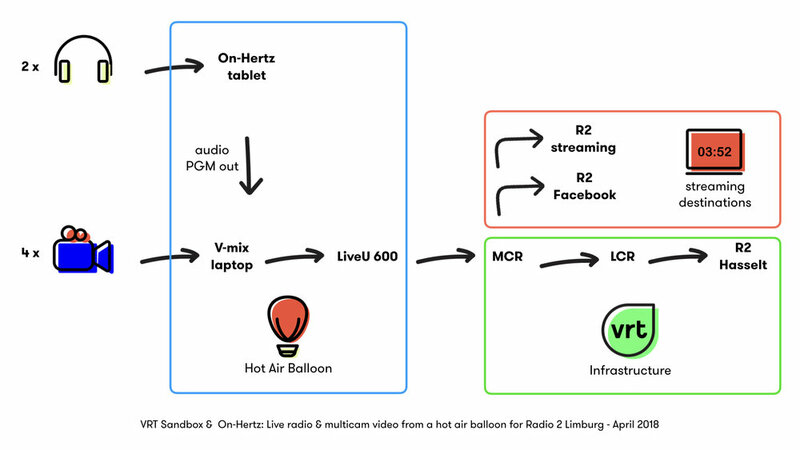 The balloon’s audio and video signal flow was channeled to VRT’s Master Control Room (MCR) in Brussels by means of a LiveU 4G bonding device. In the VRT MCR, the radio signal was transmitted to Radio 2 Limburg’s antenna park and the video content was streamed on the broadcaster’s platforms and on Facebook live. Relive the two hour balloon flight over here.